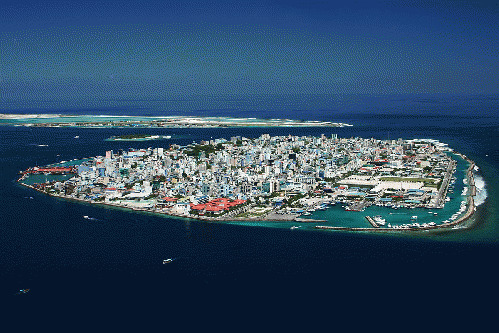 Maldives - Trouble in Paradise? rs to the two questions doing the rounds in the Maldives - an almost exclusively Sunni Muslim island nation, which is a hotbed for jihadi recruitment, make it easier for the international community to crack the whip on the Yameen regime, something it has been avoiding thus far. Question One: Did President Abdulla Yameen act according to a plan when he declared a state of emergency, and revoke it within less than a week? Question Two: Why did Yameen axe his blue-eyed lieutenant Ahmed Adeeb, whom he had elevated as Vice President by amending the island's statute? As per the Maldives Constitution, the President has the power to declare an emergency. Article 253 (Chapter XI of the 2008 Constitution) states "In the event of natural disaster, dangerous epidemic disease, war, threat to national security, or threatened foreign aggression, the President may declare a state of emergency in all or part of the country for a period not exceeding thirty days." So the first part of the condition is fulfilled, as the official line was that there is a threat to national security. But as parts of the media noted, "...it is perhaps fair to say that the declaration of emergency seems redundant. In practice, the state already exercises the power to arbitrarily detain opponents and conduct raids at will." Parliament (the People's Majlis)must be informed of the President's decision and lawmakers can accept a the emergency proposal or part or in whole. The legislature can also revoke emergency. If the President wants to extend the period of emergency he must "submit the proposal prior to the expiry of the state of emergency, and obtain the approval of the People's Majlis for such extension" [Article 257 (c)]. The 85-member Majlis approved the emergency decree on 5 November 2015 with 51 members voting in favour. So much for the constitutional part of the story in the Maldives. The real story is that President Yameen is a little desperate. One give-away was a 28 September explosion on his presidential speed boat followed by the recovery of weapons and a home-made bomb near his official residence. The FBI (US) experts who examined the speedboat concluded there was no evidence of a bomb on board, strengthening the view that President Yameen is willing to go to any lengths. The emergency proclamation came two days ahead of the mass protest planned by the opposition Maldivian Democratic Party (MDP) to pressure Yameen into releasing former President Mohammad Nasheed, who was convicted and jailed earlier this year under anti-terror laws. Nasheed was the first democratically elected leader of the country. He is also an internationally recognised climate change campaigner. MDP termed the declaration of emergency 'a direct response to the government's insecurity in assuring the upcoming no-confidence vote against VP Adeeb, and to disrupt the large protest due to take place on 6 November'. The MDP statement, however, appeared clueless as to the reasons for Adeeb's fall from Presidential grace. Only a few months ago, Yameen had the Constitution amended so that Adeeb, then minister for tourism could become Vice President. And now the very same man was being impeached for his alleged involvement in a conspiracy to assassinate the Head of State! Some reports suggest that President Yameen is suffering from Hydrocephalus, a condition characterized by an abnormal accumulation of cerebro-spinal fluid (CSF) within the ventricles of the brain. This could well be the reason why he wanted Adeeb as his Vice President, so that in an emergency, the country could be in trusted hands. But the script went haywire. As Jason Burke and Zaheena Rasheed reported in The Guardian (Nov 5) the declaration of a state of emergency came "amid a bitter power struggle between the President and Adeeb, with factions within the police and army supporting different political players". Yameen accuses Adeeb of approaching the MDP to have the President impeached. Childish! To expect Adeeb to approach the MDP is like saying the MDP appealed to India to get Yameen to release Nasheed! The insinuation is all the more surprising that Adeeb was in China when the 'boat explosion' took place. So what's with Yameen? He has already got rid of several ministers, one attorney general and two Vice Presidents. He can only consolidate his powers once he gets the constitution amended. That too may happen, if he has his way! The series of events in the Maldives since 2012 show that the country did not experience a sudden loss of democracy, but merely a gradual decline in the state of the polity since the collapse of the first democratic government of former President Nasheed. With President Yameen having taken away the fig leaf of democracy, there is reason to worry, since according to The Guardian, the Maldives are entering "a new cycle of chaos and unrest that appears to be intensifying."